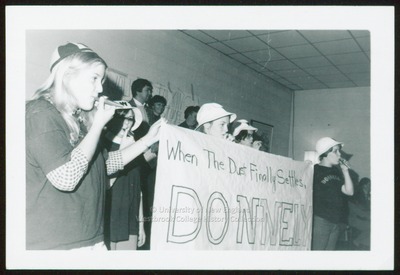 ""When The Dust Finally Settles, Donnely," Westbrook College, 1977"
Five Westbrook College students blow kazoos and hold a banner which reads "When The Dust Finally Settles, Donnely" in this 1977 Parents Weekend black and white candid snapshot. Four of the five young women wear white hats with "W" on the front; the fifth young woman wears her Westbrook beanie. On the back of the photo is written with blue ink: Parents Weekend '77.